Are you an Up and Away Grandparent? Becoming a grandparent has been the greatest highlight of my life. I always knew the grandparent-grandchild relationship was a powerful and special one, from my own close relationship with my maternal grandmother. She and I were very attached, in fact, my mother, brother and I lived with her. As I recall, she was very careful to explain to me that I must always ask before I ate anything, whether it was candy from her special candy bowl, cookies from the cookie jar or food from the fridge. I learned her rule early on and knew, most times she gave her permission for treats if I simply asked her. Hers was a simple rule. I guess it made me realize that I mustn’t eat things unless I asked first. In the 50’s when I was growing up, medicine containers did not have special lock caps on them, children’s medicine always tasted like some sort of candy and adult pills looked like M&Ms. Except for today’s lid lock containers not much has changed. As I recall, in my childhood home alll medications were kept very high up on a shelf so I could not reach them. When I had my own kids I kept the same habit of putting bottles up high, I took care to refrigerate medication on the highest shelf in the back of the fridge, as inaccessible as possible. During my work as a pediatric nurse, I had personally seen what improper use of medications could do to both adults and children. So even aspirin was off limits to my teenagers since there is a connection to aspirin and a potentially life threatening illness known as Reye’s Syndrome. Today, I guess you would call me a helicopter grandparent when it comes to medications in my home where my grandchild is a frequent visitor. She spends time with us and has her own room so she feels very comfortable going to cabinets, getting snacks and raiding the refrigerator at 6 years of age. Just as any good grandparent, I worry about her safety. You see, she has a nut allergy as well. So at a very young age, she was made aware of her need to stay away from any and all nuts. As a nurse, I am a consistent medication label reader and with a nut allergy in our home, I now had to carefully read food labels as well. To be on the safe side, I choose not to buy food items that are exposed to nuts in their processing so I do not have to worry about nut exposure from contamination. For many “older adults” medications are a fact of life. Some of us take medication on a daily basis so it becomes imperative for these medicines and other over the counter medications to be stored “up and away” from “little hands” and curious “little fingers”. It is my honor to have been included in the Up and Away program to help grandparents like myself keep grandkids safe and healthy all year long. 5.4 million kids of today are being raised in households headed by grandparents. Our goal as parents and grandparents is raising a happy and healthy child. This can be challenging through all the developmental stages of childhood. Toddlers pose a special concern as the notoriously possess a need to explore their environment. Each day 4 bus loads of kids are taken to the ER for accidental medicine ingestion. Annually that is 60,000 kids, who have ingested medicines that belong to parents (39% of the time) or grandparents (38% of the time). Education is a key factor in the prevention of accidental medicine ingestion by children. Do not leave grandparents out when it comes to baby proofing or child proofing homes and remember it is more than electrical outlets that should be of concern. Storage of all medicines and vitamins “up and away” and out of sight when young grandchildren are around. I would include all children including teenagers as well. 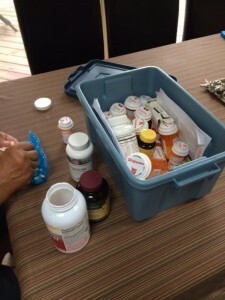 Keep purses, bags, and coats that contain medicines or vitamins out of reach and sight..
Weekly pill reminder kits usually do not come with locked tops so these are of particular concern. They must be stored out of reach. It is a good idea for grandparents to set a reminder to take medications, since the pills will be safely out of sight and therefore perhaps out of mind. Program the national Poison Help number 1-800-222-1222 into your phone and post it in your home in case of an emergency. Take inventory before babysitting or traveling to a grandchild’s house or before grandchildren visit your home. 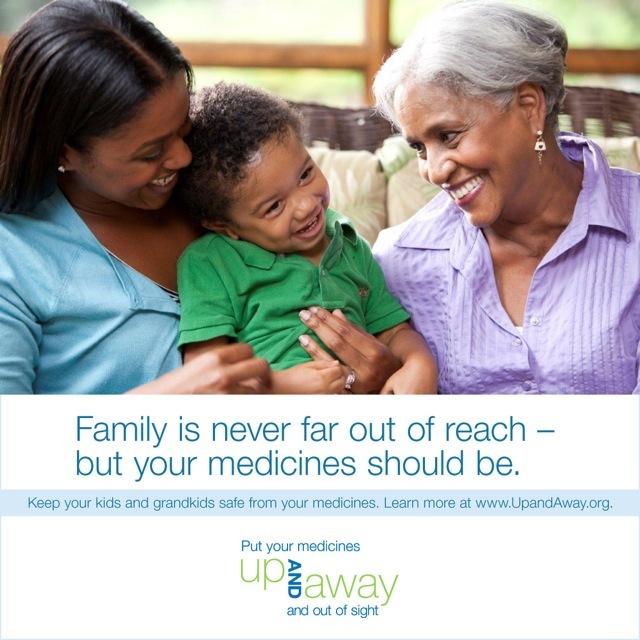 Share Up and Away‘s grandparents’ medicine storage tip sheet with readers and friends. Grandparents and parents who are reading this blog post, it is meant to be shared. This is grandparenting in the digital age. We are so fortunate to be able to educate each other through e-mail and social media. I know personally, I have learned a tremendous amount from my online virtual friends, some are professionals in healthcare and child growth and development, others are moms, who are not afraid to share personal experiences in order to make the world a little safer for each and every child. Log in to Up and Away and Take the Pledge – ask your friends to do the same. Disclaimer : Up and Away is an educational program to remind families of the importance of safe medicine storage. It is an initiative of the PROTECT Initiative, in partnership with the Centers for Disease Control and Prevention and the Consumer Healthcare Products Association Educational Foundation. I am being compensated for this blog post but my opinions are all my own. This entry was posted in Family, Grandmas & Grandpas, Kids, Moms & Dads, Safety and tagged grandparents, medication safety, safe medicine storage, up and away, UpandAway.org by llpitlwp. Bookmark the permalink. Hi folks — lovely and thoughtful article! 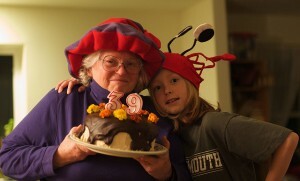 Can you update it to give photo credit for the “grandmother and grandchild” photo at the top to Tim Pierce, with a link to the original at https://www.flickr.com/photos/qwrrty/4100076626/? Thanks! Done,so sorry for my mistake in this post. It is always my intention to give credit to everything I post.